Have you ever wondered about our closest astronomical ally? 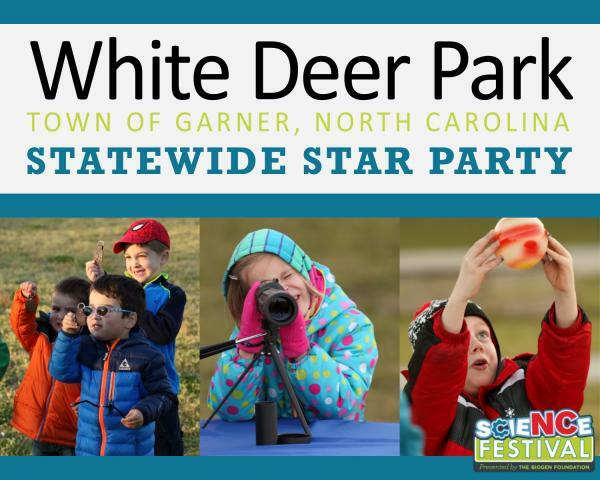 Join us at White Deer Park for the 7th annual Statewide Star Party. This year’s theme is “The Moon and Beyond.” We will have hands-on activities, telescopes, crafts, s'mores, and story time by the fire. Come explore our sister sphere and all of her wonders. Raleigh Astronomy Club will join us with their astronomy expertise and telescopes. Feel free to bring your own equipment and join in the skywatching fun. Don’t forget your flashlight! We also encourage a blanket or folding chair. The Star Party event is free and open to the public. Questions? Contact White Deer Park Nature Center at 919.661.6982.